Criminal investigation sought over Hillary Clinton’s State Department email use. 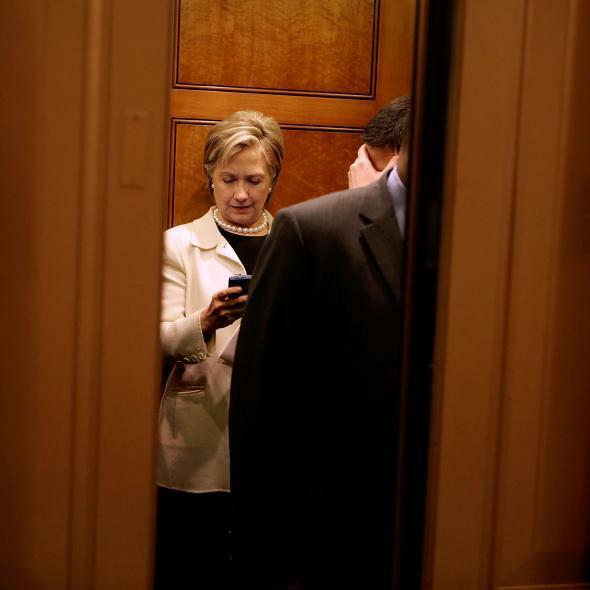 Hillary Clinton looks at her BlackBerry on an elevator in Jan. 2009. Original post, July 23, 11:56 p.m.: The Justice Department has been asked to open a criminal investigation into Hillary Clinton’s use of a private email account while serving as Secretary of State and whether it criminally compromised classified information. The request was submitted by two inspectors general and is being reported by the New York Times. Internal memos, reviewed by the Times, suggest that Clinton’s private account could contain hundreds of classified emails, although whether or not they were classified when the former Secretary of State received them is not clear. Clinton has maintained no classified material was on her personal email and that she was aware of the classification requirements. The State Department has, however, retroactively classified some of the emails during the process of handing them over to become part of the federal record. Officials at the Justice Department say no decision has been made on whether to launch a criminal investigation.